Anyone here tech-savvy? I want to connect my laptop to my tv so that I can watch movies and things on the tv screen but the numerous kinds of cables available is making my head spin a little. 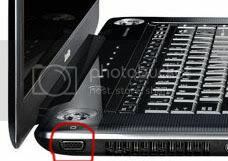 My computer is a Toshiba and it has a VGA outlet (looks like the outlet circled in red in this picture). 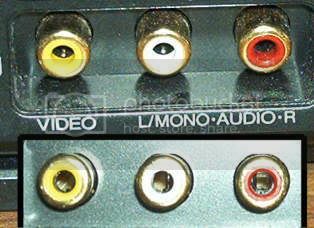 My tv, on the other hand, doesn't have the VGA outlet, it has an RCA outlet (those yellow, red and white outlets that look like this). Now I'm not sure if they sell cables that have VGA on one end and RCA on the other (probably not...that's make things far too simple >__<) so I was thinking maybe I can get a VGA-to-RCA converter and then an RCA cable to hook up the laptop to the tv? Would that work? Has anyone else ever tried to hook up their laptop to their tv and can give me some advice before I go bubbling into the electronics store and try to gesture our what I need? i'm pretty sure life is that simple - there are vga to rca cables available! i mean, if you can hook up your digicam to the tv with one cable, surely the same is possible for the computer.